Luckily, I stayed up late that night, reading by lantern light until my eyes burned. Yeah, you guessed right – we don’t have electricity. When I finally accepted that the book was too long to finish before morning, I closed it grudgingly. Loonie, our ancient German Shepherd – she’s almost thirteen, like me – raised her head and whined, sensing I was about to desert her. I scratched behind her ears, then picked up the lantern and carried it into the second room of our tiny cabin, the bedroom I share with my mom. The cold floor bit at my feet and the air wasn’t much warmer, even though the door was wide open to the front room where our wood stove belched out heat. I jumped beneath my big fluffy quilt and snuggled in, then peeked out to blow out the lantern. Mom slept on undisturbed. Moonlight splashed through the small window above her bed and coated her blankets with liquid silver. Her face was peaceful in the glow. She’d never know how late I stayed up. I closed my eyes and began my own trip to dreamland. Hunger and pain rumble into my body like an avalanche. My legs are raw and bloody, my stomach an empty cavern. I long to drop into the soft snow, I am so weak and tired, and so very, very cold – but death lies there. And worse. I can face my own death. But the death of my foal – and he will die without me – I cannot bear. The mustangs were near. And they were starving. Okay, time out. Let me explain before you think I’m totally crazy. I have a “gift.” I hear horses. Actually, maybe hear is the wrong word. It’s more like I can feel them, and with some horses, the ones who think more abstractly, I can translate my impressions into words. Basically, when a horse steps into the river, I sense what it senses – wet, cold, the current pushing – and though I’m not in the river, or near a river, the feeling of stepping into a river is completely real to me. Usually it’s not quite as strong as things I feel myself as a human – unless the feeling is panicky or desperate. Then it takes over. Completely. That’s only happened a few times, but believe me, it’s not remotely cool. It’s terrifying. Only Rusty, my gray gelding, knows about my weird talent, if it can even be called a talent. Rusty and I can even talk. He’s picked up a bit of language and grammar. I know that sounds crazy but it’s true. And in turn, I’ve learned how to better interpret horse thoughts by speaking with him. I’ve never talked to any other horse but Rusty – well, except once, and it ended very badly for the horse. She was one of the mustangs. Her name was Willow, and – I’m sorry. I can’t go there. I thought I could, but I can’t. Let’s leave it at that. No humans know of my ability. I learned to keep quiet about it because of my mom. I tried to tell her once, a long time ago when she said she believed in magic. I don’t know what kind of magic she was talking about because when I told her about hearing the horses, she completely freaked. Apparently, she always thought I was spouting poetry when I’d say strange things as a little kid. Ha! I’m about as poetic as a doorknob. When I told her about “feeling” the horses, she got all weird and started ranting about how she was ruining my life and stunting my emotional and social growth by keeping us out here in the wilderness. She went on and on about how I was “bushed and eccentric.” Thanks, Mom. It took all my powers of persuasion to convince her I was just pretending to understand horses, that I was joking. She became furious – which was much better than her being upset and worried. Too much worry might make her think she has to leave the Chilcotin, our remote region of British Columbia, to save me from being a social misfit. But I love being a social misfit. I love it here in the wild. Okay, so now that you know about my psycho psychic ability, back to the mustangs. I knew these horses. Willow belonged to their herd. I searched for her thoughts among the pained voices. Was she there? Had she survived, despite what I’d done to her? I heard Night Hawk, the herd stallion, telling Twilight, the yearling buckskin filly, to not lag behind. Then I focused on the mares and their children: Wind Dancer, a pretty palomino and Twilight’s dam, Black Wing, dam of two-year-old Dark Moon; and Snow Crystal, a gray mare so old that she’d long ago turned white. 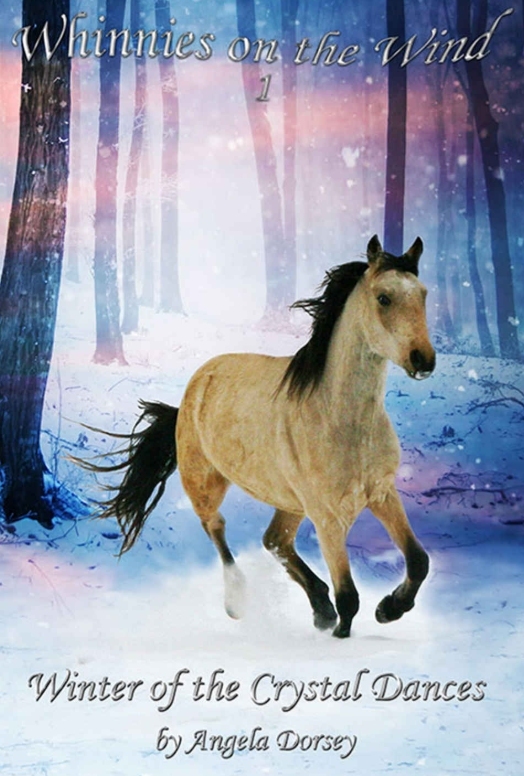 Her latest – and probably last – foal, a blue roan colt named Ice, ran at her side. My mind went back through the horses, but I hadn’t missed anyone. Willow wasn’t there. I blinked back tears. So she had died after all. The accident must have left her too weak to survive this brutal winter. I got out of bed, pulling my quilt with me and wrapping it around my shoulders for warmth as I hurried to the window on my side of the room. Outside the window was a fairytale land, everything frosted with untouched snow and the moonlight so bright that you knew that if light could sing, this would sound like a distant flute’s high melody. No moon-dogs though, those weird bright patches that appear on each side of the moon whenever ice crystals linger in the air. I was glad not to see them, because they usually mean the coming of worse weather. But moon-dogs or no, I could see it was harsh cold out there. The sky was empty of clouds and the snow seemed strewn with diamonds. The tree branches sparkled. Perfect stillness reigned. It looked exactly as it had for the last two weeks. My forehead touched the window and I jerked back when the glass burned frigid against my skin. The mustangs were right – it was horribly cold out there, the type of weather that cracked trees and killed wild animals. And they were obviously past the point of being able to fend for themselves. They needed food and shelter. I couldn’t just stay inside where it was warm and let them pass by without doing something. I had to help them. Quietly, I put on my warmest clothes and then pulled my second warmest out of my drawers. Mom moved in her bed, disturbed by my rustling, even though I hadn’t relit the lamp. Toenails clicked as Loonie walked across the front room and into the bedroom. I knelt down to pet her. She knows she’s not allowed away from the door on the super-cold nights that Mom lets her inside, but then again, it’s not every night one of your people gets up and puts on masses of clothing. “Evy?” The toenail clicks must have awakened Mom. “They need help, Mom. I’m going to put some hay in the meadow. It’s been so cold and if they’ve come this close to the house, they’re probably starving.” I pulled my second warmest shirt on over my warmest. Mom swung her legs from under her covers. “I’ll come too,” she said, then gasped when her feet touched the freezing floor. She was right, of course. When exposed skin can freeze in less than a minute, it’s dangerous being anywhere outside. Mom lit the lantern and quickly we bundled up in clothes, hats, coats, scarves, mittens, and boots. I whispered to Loonie through my scarf to stay inside, then opened the outside door. A frigid wall of air shoved its way into the cabin, making me shiver beneath my layers. “Hurry,” Mom said behind me. I stood to the side to let her past. I wore way too many clothes to actually hurry. Mom waddled past me and through the door, and I couldn’t help but laugh. She turned to look at me following her, then started to giggle. I must be waddling too. 1. Why was the girl, Evy, reading by lantern light? c) she liked to use the lantern instead of turning on the lights. 2. What was Evy’s special gift? 3. Why was Evy worried about the Mustangs? 4. Why was it ok with Evy that her mom did not believe in her special ability? 5. Why did Evy and her mom go outside? Special thanks to Angela Dorsey for providing us this excerpt from her wonderful book.